I love guns. And coffee. Judging by the wide variety of Starbucks-knockoff patches, pins, shirts, etc. stating the same tells me I’m far from the only one. Soldiers, too, have long had an affinity for those two lifesaving staples. Back during the Civil War, they were considered so indispensable that there was an attempt to combine the two. Collectors have come to know these experimental combinations as the “coffee mill” Sharps rifle. And, if you can find a real one, it can be quite expensive. Lt. Col. Walter King, a soldier with a Missouri cavalry outfit, developed a grinding mill that could be incorporated into the buttstock of a Sharps carbine. History describes the purpose of the gun as follows: one man in each cavalry company was to be issued one of these guns and he would be responsible for grinding coffee for the men in his unit while they were living out of the saddle. The real purpose, however, was a little different. In January 1865, King’s invention was tested and reviewed by the inspection board. It’s in these reports that we learn the gun was actually to be used to grind grain, not coffee. Unfortunately, there were a variety of problems with this concept. First, if soldiers were lucky enough to stumble upon a sizable amount of grain while out foraging, chances are that it would have been near a mill that could be used to grind the grain in a much more efficient manner. The next issue was compatibility. 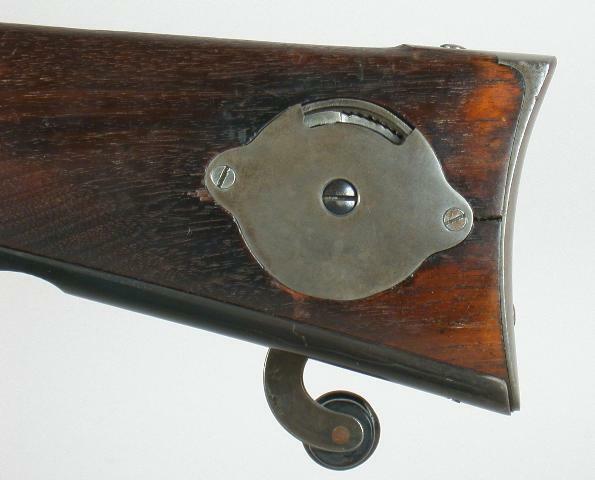 The mill was designed to work with a solid buttstock, meaning it couldn’t be adapted for use in a Spencer carbine because the magazine tube was located where the grinder would need to go. The final issue was weight. Officials believed that if a soldier was going to have to add weight to his kit, it should come in the form of ammo, not a novelty grinder. Nonetheless, some did make it into production. Exact numbers produced are unknown, but it’s believed that less than 100 were made and only a dozen or so survive today. Even so, these guns turn up every few years, often enough to lead you to believe that far more than 12 survive. That’s because the parts laid around the St. Louis armory until the 1920s when an employee started installing them in original Sharps carbines. As such, it can be very hard to confirm if an example is original or fake. A number of years ago, the example at the Springfield Armory in Massachusetts was discovered with coffee grounds still in the mill when it was cleaned by museum staff. It was later learned that the leftover coffee wasn’t from the Civil War. Instead, it was from a more recent test done by the armory’s director who didn’t thoroughly clean it afterward. His test proved that the mill worked, but not well. I just finished reading a book on the Sharps rifle. Old Christopher Sharps was a hell of an inventor and gunsmith, but his business endeavors all had problems. I think he left the company before this idea came down the pike, though. Is there space on the Picatinny rail for one behind my chainsaw? Actually I recall that there was an attachment for the rail mounted chainsaw that would grind coffee and mix Margaritas. I’m that oddity in American military history. Never liked coffee and wouldn’t drink it. It was said that I made the best pot of coffee in the outfit. My secret? I cleaned the pot. Cleaned the pot???? Boys, I’ll hold his feet while you rustle up a rope. In my defense, guys. I told all involved that I had never made coffee before and didn’t drink it. This is what happens when you give a 17yo unsupervised duty. I am kinda proud of the fact that as I was making coffee one day and in walked a light colonel and a major from a different outfit with their coffee cups. They told me that people from different units were bragging on my coffee. They did too. I still don’t like coffee and couldn’t tell you a good cup from a bad cup. It all tastes like burnt motor oil to me. Cleaning the pot is ok. It’s the cup that you merely rinse out. These were issued to mounted troops. The regs of the time restricted the weight of a calvary trooper and his gear. His weight was restricted to a max of 140 pounds(modern actors and re enactors would have been assigned to the artillery or grunts in the day) and the total load of him and his gear was cut off at 200 pounds. Adding even small amounts of weight to his load out would have been tough under their regs. Reenactors are a joke for the most part. Rotund Infantryman. In Gettysburg right before Picket’s Charge they show a big fat Infantry Officer ready to cross that field. Ruined the scene. Story goes – the southern ports were under Union blockade and coffee was hard to come by… so chicory nuts were used to cut the product and stretch the dwindling supplies. Seems some folks just developed a taste for it… myself included. A whiff of Community coffee still takes me back but the wife can’t stand it… I should go buy a bag just for myself. Chickory is that blue flowered ditch weed you see growing everywhere . The roots were dug , dried , and ground as a substitute for coffee or as a coffee expander . They were roasted before being ground . That coffee has a tendency to blacken teeth . I suspect it had nothing to do with appeasing coffee addictions amongst the troops and had more to do with giving energy boosts to soldiers who often had to fight or march past the point of exhaustion. Those guys had little in the way of personal comforts and a little coffee or tobacco made a huge difference in their performance as soldiers. Eureka! Now I know how Starbucks got the idea to make coffee that tastes like gunpowder. If my memory serves me well an episode of the TV series Columbo featured this rifle as part of a plot twist in that particular episode. I was thinking the same thing. I didn’t remember what detective show it was though. I think a beer Brewer would have been more to my liking.